MORE job vacancies are going unfilled for six months or more, as a tight labour market and stricter foreign worker policies take their toll. According to a report released yesterday by the Ministry of Manpower, the number of positions left untaken for at least six months rose from 18,230 in the year to September 2011, to 20,930 the following year, a 15 per cent increase. That means four in 10 of all vacancies as of last September were unfilled for at least six months. There were 56,400 job openings as of last September, up slightly from the year before. Service and sales staff positions made up the biggest chunk of these vacancies - almost a quarter - and included sales assistants, waiters, security guards and cashiers. Associate professionals and technicians accounted for another 17 per cent of openings, and professionals, 15 per cent. Low-skilled jobs are the most likely to be left unfilled for longer periods, as local workers shun tough work and low wages. Of the positions that were not taken for at least six months, some 83 per cent were for workers other than professionals, managers, executives and technicians (PMETs). Of the long-term unfilled vacancies, a third were for service and sales workers, and another 22 per cent for cleaners, labourers and related workers. Those were also the two job sectors for which bosses reported the most difficulty in finding locals. "This is an indication that the move to moderate the inflow of foreign workers is having an impact on the labour market," said Mr Mark Hall, vice-president and country general manager at recruitment consultancy Kelly Services Singapore. As the Government tightens the tap on foreign worker inflows, such as with tougher quotas and higher levies, companies have had to turn increasingly to local workers. But bosses said they had trouble hiring Singaporeans for two-thirds of all openings. Especially problematic was "attracting locals to take up lower-skilled jobs", said the report. 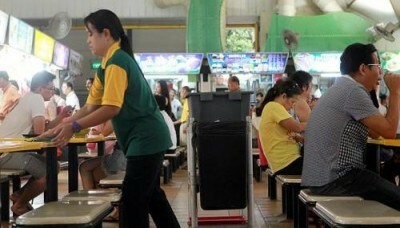 Employers found more than nine in 10 vacancies for cleaners, labourers and related workers hard to fill with local staff. It was the same for almost nine in 10 service and sales openings. In contrast, fewer than four in 10 PMET positions presented such a problem. Evergreen Refuse Disposal and Cleaning Services, for instance, has been looking for cleaners for "the past few years". "It's quite common for cleaning companies," said its administrative manager Esther Kow. The company puts out recruitment advertisements several times a week, she added. The most common reasons given for the difficulty in hiring locals were those associated with low-skilled jobs: unattractive pay, physically strenuous tasks, a poor working environment and shift work. Credit Suisse economist Michael Wan said the vacancies show a "structural mismatch" between demand for low-skilled workers and an increasingly educated workforce. For more than 54 per cent of all job vacancies, only secondary or lower education was required. Workers without higher qualifications than these form four in 10 of Singapore's resident labour force. OCBC Bank economist Selena Ling said that given the tight foreign manpower constraints, the "growing aspirations" of Singaporean workers may "hurt the ability of employers to fill certain types of jobs like cleaners and labourers proportionately more". But she did not think the economy faces a major structural mismatch, saying that overall unemployment - 1.9 per cent last September - was still extremely low.